LOS ANGELES - Robert Kajiwara knew he did not have much time to act before construction work began for the controversial relocation of U.S. Marine Corps Air Station Futenma in Okinawa Prefecture. 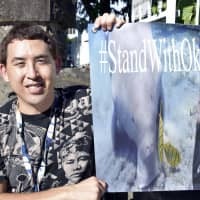 So the 32-year-old turned to the White House’s We the People petition website as a last resort, hoping that the U.S. government would intervene in what he sees as the impending destruction of Oura Bay and its ecosystem for the move of the inland military base to the coastal area of Henoko. Within 10 days of creating his petition on Dec. 8, it had garnered the support of Okinawa Gov. Denny Tamaki and various Japanese celebrities and reached 100,000 signatures, surpassing the requirement for a response by the White House. As of Monday afternoon, the petition titled “Stop the landfill of Henoko/Oura Bay until a referendum can be held in Okinawa” had topped 160,000 signatures. The petition asks U.S. President Donald Trump to order a halt to the reclamation work at Henoko until a referendum is held in February so that residents can use their votes to show whether or not they want the base. On Dec. 14, despite widespread resistance from Okinawa residents, the central government began offshore reclamation work on the facility, which when completed will replace the Futenma air station that’s currently located in a crowded residential area of Ginowan, also in the prefecture. Kajiwara, who splits his time between Okinawa — where his mother’s family lives — and Waipahu, Hawaii, has visited Henoko in past years to join protesters of the base. 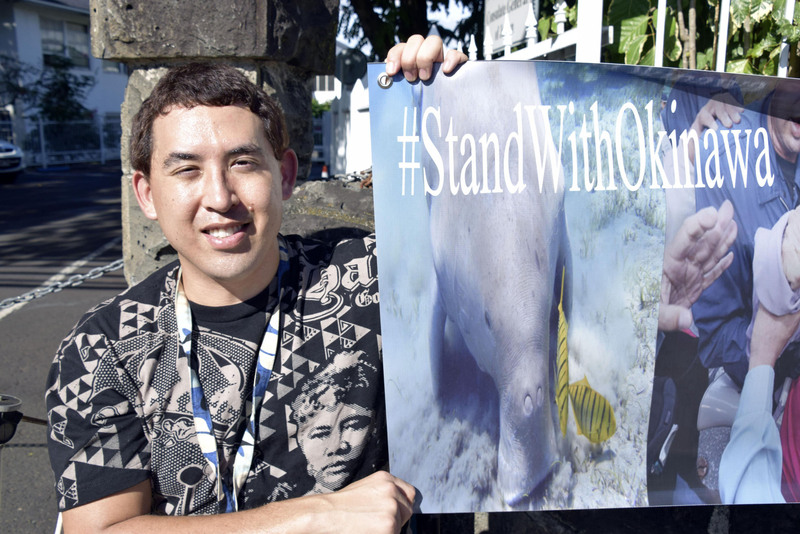 He has also worked as an activist for native Hawaiians’ rights, he said. On Tuesday, Kajiwara organized a demonstration outside the Japanese Consulate in Honolulu as part of a National Day of Solidarity for Okinawa, which included events in New York, San Francisco and Seattle. Okinawa was occupied by the United States after World War II and returned to Japanese sovereignty in 1972. Local residents have been frustrated by noise, crime and accidents related to the presence of the U.S. bases in the prefecture. But Kajiwara has hope that Trump will “do the right thing” and halt the construction until Okinawa votes on the issue on Feb. 24. Though the number of names on the petition has increased steadily over the course of two weeks, Kajiwara worries that the White House will not consider the air base construction to be an American issue, given that the majority of those who signed are Japanese citizens. As he waits for a response from Washington, Kajiwara continues to receive messages of support from Okinawa residents and those living elsewhere in Japan. “As an Uchinanchu-Hawaiian and with my multicultural experience, I hope that I can be of service to the Okinawan people and to help bridge the gap between Okinawa and Hawaii and the continental United States,” said Kajiwara.